It wasn’t long ago that race fans didn’t have any insight into what the data of professional cyclists in the Tour de France looked like. As a major cycling fan and data geek myself, I always wondered what kind of numbers the Tour riders were putting out. Today, through the efforts of power meters and software companies like TrainingPeaks, we have a very clear picture of what it takes to compete in the world’s biggest bike race. At TrainingPeaks, we have been longtime advocates for making cycling more transparent, but many of the riders themselves are also starting to question why race data has been held so secretive for so for long. Several riders in the peloton have taken it upon themselves to freely share their race data, sometimes within minutes of crossing the finish line. Race analysis is also starting to evolve as cycling fans become more sophisticated and knowledgeable about how to watch bike races. To the inexperienced eye, cycling may look like a boring or confusing sport, but to the avid fan it’s a chess match on wheels with endless variables that can disrupt the best of strategies—or the strongest of riders. Race data can give us an inside view into the results as well as foreshadow the next day’s events. The numbers give depth to the story and can reveal the reasons a team’s plans were disrupted. This shows up as peak power values set early in the stage, which create a dark and dismal final hour of racing. Likewise a power file can reveal a hero, such as when a teammate comes to the rescue and takes on the workload to help their leader save energy for the finishing climb. What did it take for our hero to save the day? Was it their hardest effort of the race? Could they have gone even harder? These are questions and answers that can only be revealed through the numbers. I liken race data and the ability it gives us to create richer post-race analysis to the kind of game day coverage we’ve become accustomed to within the big three American sports: football, basketball and baseball. These sports track stats and dive into the numbers during and after each game. Halftime is a time to analyze the stats of the star players and make second-half predictions. Post-game shows summarize the stats and reveal an extra layer that wasn’t evident during the game itself. What was the quarterback rating? Who had the most assists? 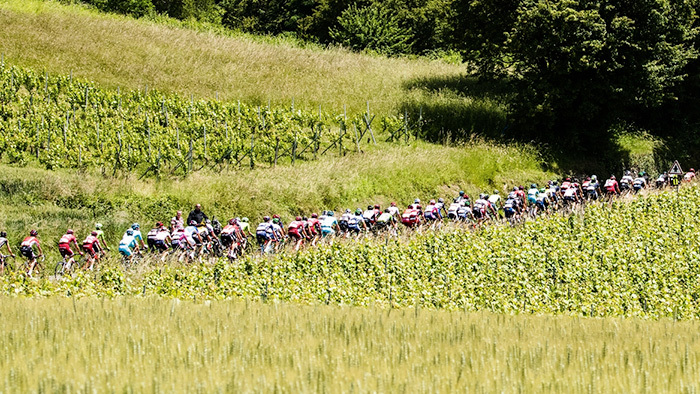 As you come across race-day files from the pros during this year’s Tour de France, you can do your own analysis as if you were the expert cycling commentator. Take a look at the stats and see what conclusions you come to. There’s no exact science when it comes to analyzing power files, but here are a few things I’ve picked up over the years that may help you make sense of this year’s power data from the Tour. Duration and the Training Stress Score® (TSS®) of the race is one of the first things I look at. This helps me determine how hard the race was. 100 TSS denotes an all-out, 100 percent effort for 60 minutes. As a rule of thumb, you can’t accumulate more than 100 TSS points an hour. TSS also tells me a little about the rider’s Functional Threshold Power (FTP) settings. The TSS accumulated within the stage can show how hard it will be to recover from the day. As a general rule, Joe Friel calls 150 TSS the threshold for a “hard workout.” Anything over 300 TSS will be tough to recover from and certainly be felt for days to come. You can also look at the Intensity Factor® (IF®) of the race to determine how intense this athlete’s effort was the day, relative to their FTP. A very hard race will have an Intensity Factor of .75 or higher. One great example of a 300+ TSS day and a race that produced an IF of higher than .75 is former Tinkoff rider Michael Rogers’ stage 16 victory at the 2014 Tour. His amazing effort brought him a big win on a very tough day in the saddle. By taking a quick look at the rider’s Peak 20-minute Power value of the day, you can get a sense of how intense the rider raced. We choose 20 minutes because riders rarely ever race 100 percent for 60 minutes, but they do race at 95 to 100 percent for 20 minutes on climbs. So you can get a good indication of FTP by looking at their peak 20-minute power output. For their peak 20-minutes, I look at both their watts and watts/kg, a measure of their power to weight ratio. Don’t get fooled into looking at the absolute watts value, as two riders may produce the same watts but that may mean dramatically different watts per kilogram (w/kg). Your w/kg determines your speed as all else being equal, the higher the watts or the lower the weight, the faster the rider will go. A quick look at peak 20-minute watts/kg can tell you how hard the rider went on the climbs. Quite a few top climbers in the Tour de France can ride right at or slightly above 6.0w/kg for 20 minutes. If their peak 20 minutes was less than 5.5 w/kg, they were well within their limit. How does the power trend look within the file? This can tell you if the rider raced hard in the first half of the race (maybe trying to get into a breakaway) or in the last quarter of the race. On the big, important stages the team leaders will ramp up their intensity so they are going harder at the end than they are at the beginning in an effort to stay with, or get away from their rivals. Riders going for a stage victory or who help protect their team leaders tend to put out their max power values in the first half of the stage and then just ride to get to the finish line. This can be different on sprint days, where max values for almost everyone are found near the end as the peloton stays together for the sprint finish and the average speeds ramp up at the end with attacks. For a time trial, I usually start by comparing average and Normalized Power® (NP®) for the first versus the second half. I may also do this sometimes for long, key climbs. I also look for segments with obvious surges or “burnt matches” (significant efforts over threshold) that could denote attacks from the peloton or a rider trying to make a break. The role the rider plays within the team determines a lot when it comes to analyzing the data. I take a look at when Peak Power values occur in the file to see when the rider was working hardest. As mentioned earlier, a team leader will tend to put out higher power values near the end of the stage as they race for precious seconds, while team domestiques (helpers) may put out their peak power values well before the finish line in an effort to help their team leaders. When you see a domestique cranking out over 10 w/kg to lead out their team leader for a potential win, and then see the power drop as they “pull the plug” and roll in to the finish once their job is done, it really becomes apparent just how much of a team sport cycling is. An example of this can be seen in Lotto-Belisol rider Greg Henderson’s file from Stage 4 of the 2012 Tour, when he cranked out 9.5 w/kg in the final minute to bring Andre Greipel across the line for the win. Flat tires and bad luck can also sometimes be viewed within a file as a rider may have to chase back on after a crash or a flat. Instances like these can zap their energy and can cause time loss near the end if a chase created too much fatigue. Variability Index (VI) is primarily a metric you may want to take a look at when analyzing time trials. Variability Index indicates how smooth the rider paced their effort. The more evenly they produced power, the closer to 1.0 their VI will be. This is very evident on uphill time trials where there isn’t a lot of variation between the peak power outputs and the average watts. In fact the formula for calculating VI is simply NP divided by average power. NP is an estimate of the power you could’ve maintained for the same physiological “cost” if your power output had been perfectly constant, and it provides a better measure of the true physiological demands of an effort by taking into account any power surges. You will see a higher VI if a time trial is flat and has a lot of corners which demands a lot of power spikes as the rider negotiates turns and powers back up to speed. In general the lower the VI the better job the rider has done in pacing their time trial. However a team time trial would invariably have a large VI since the riders are taking turns on the front where they have huge power spikes alternated by lower power values when sitting in the draft.